The second Early Access content update to Mordheim: City of the Damned hit Steam today, making a number of changes to the game and, more significantly, adding several new features as well. The Cult of the Possessed, a group of "degenerates and mutants" who seek the favor of the Shadow Lord, is now available as a playable Warband, and Warbands now have "reserves" that players can choose from before going into combat. The trailer above covers the big changes in the update, but the narrator speaks pretty quickly and there's obviously an assumption that you already know what he's talking about, so you might want to nip over to the Steam page and take it in at more of a leisurely pace. The update also enables all actions that are described in the tutorial ("Search and pray are now possible during Missions," which presumably they weren't previously), there are new extra objectives, and time limits can now be set on unit turns. 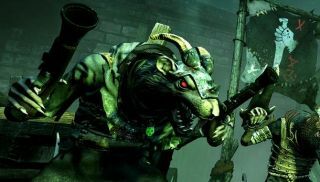 Mordheim: City of the Damned is based on the Games Workshop tabletop game Mordheim, in which players lead small groups of fantasy archetypes into turn-based, tactical-level battles. It is perhaps not the best-known of Games Workshop's properties, certainly not up there with Warhammer 40K or Warhammer Fantasy, but as Tom Senior noted in its announcement last year, it's got bipedal rats packing dual flintlock pistols, and that alone makes it worth a second look. As mentioned, Mordheim is out now on Steam Early Access. A full release date, at least as far as I can tell, has not been announced.